Happy Memorial Day! I don’t know about your family, but for mine today marks the traditional beginning of Summer. The weather outside was gorgeous here, all blue skies and sunny but not sweltering. The pool is lovely, if a tad chilly, but the kids were brave enough to swim for a bit. Lunch was hot dogs, nothing too fancy. The real Summer time celebratory treat came for dessert. I had a ripe mango in the fridge. I don’t know a lot about mangoes, or even how to cook with them, so I thought a day when the husband is home and I have some free time would be perfect for experimenting. After looking around at breakfasts, smoothies, and a few odd beauty masks, I decided to follow my own path. 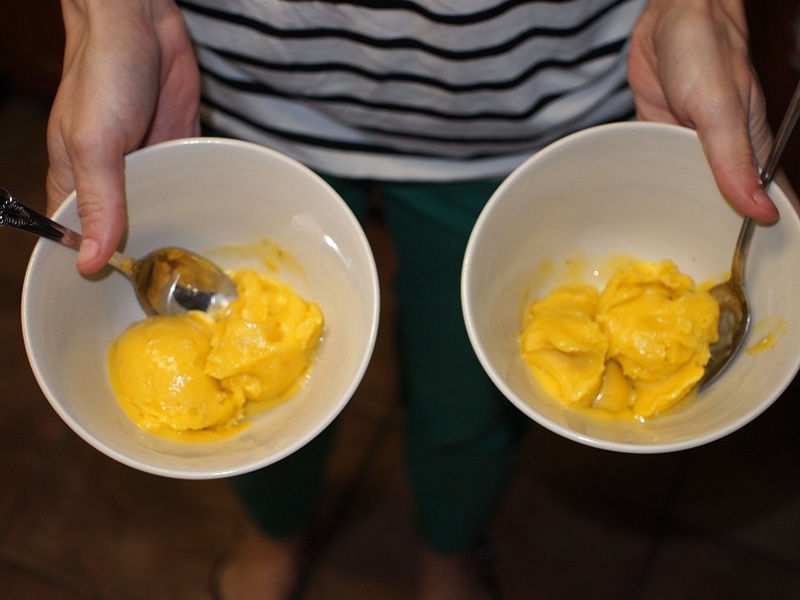 Mango Ice Cream! Yes! Sounds delicious, I’m sure I can make something work. 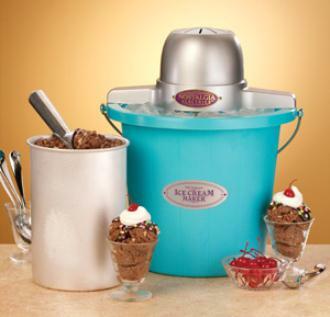 I have a fancy new “retro” ice cream maker I bought on Amazon.com for quite a good price, I’ve only used it once and I’ve been itching to use it again. Perfect. Retro, turquoise, and all kinds of snazzy. This is a recipe of my own design, and I’m not one to use measuring tools, I trust my “eyeballing”, but I’ll be as detailed as I can in case any readers are interested in making it for themselves. I assembled my ingredients and went to work. 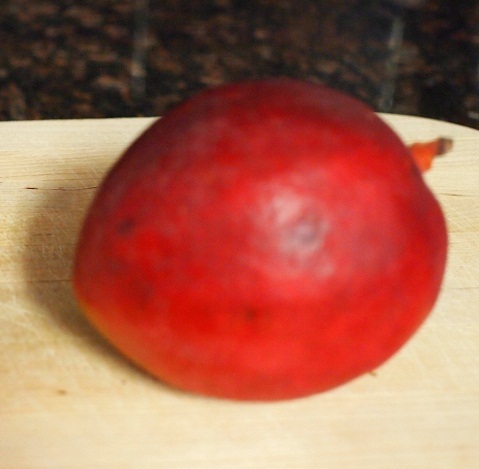 I began with one mango, very ripe as I wanted to get the full sweetness when I used it. Cut and peeled it on the cutting board, which is the messiest part of this, but honestly I like how it feels to squish mango in my hands. Moving on… I had half a banana in that had been chilling in the fridge, since my daughter wanted some on her cereal this morning. My mouth was watering. This is going to be GOOD. For a moment I felt all “love it when a plan comes together”. 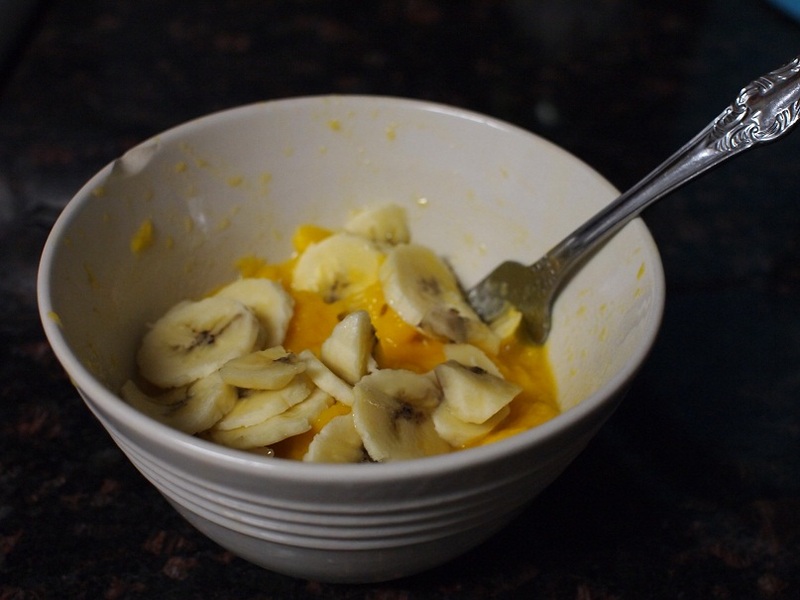 It’s a good amount of banana to add flavor and sweetness but not overpower the mango. I hate it when I buy something that has banana in it and banana is all I can taste. I tend to avoid smoothies or yogurts or other products that are “Something AND Banana”. Just the right amount of banana. 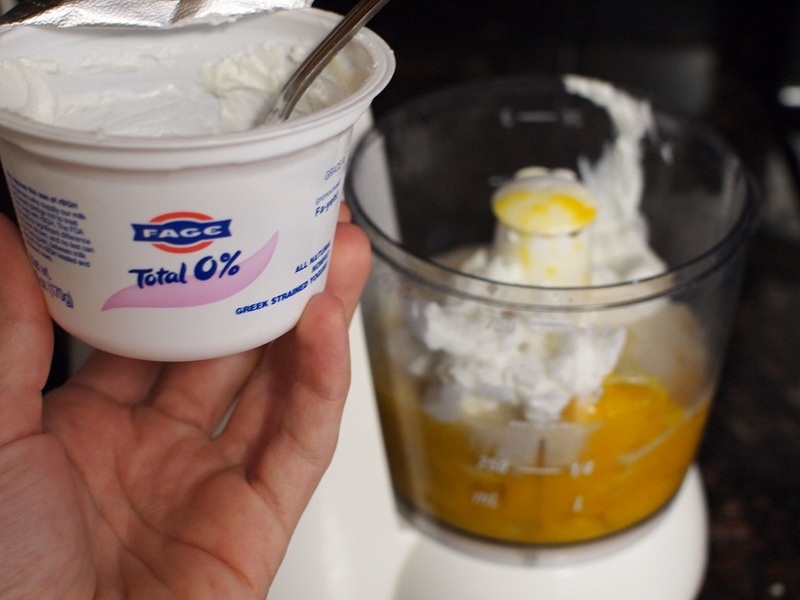 Greek yogurt is wonderfully bitter, and acts to dial down the sweetness of the banana a bit. 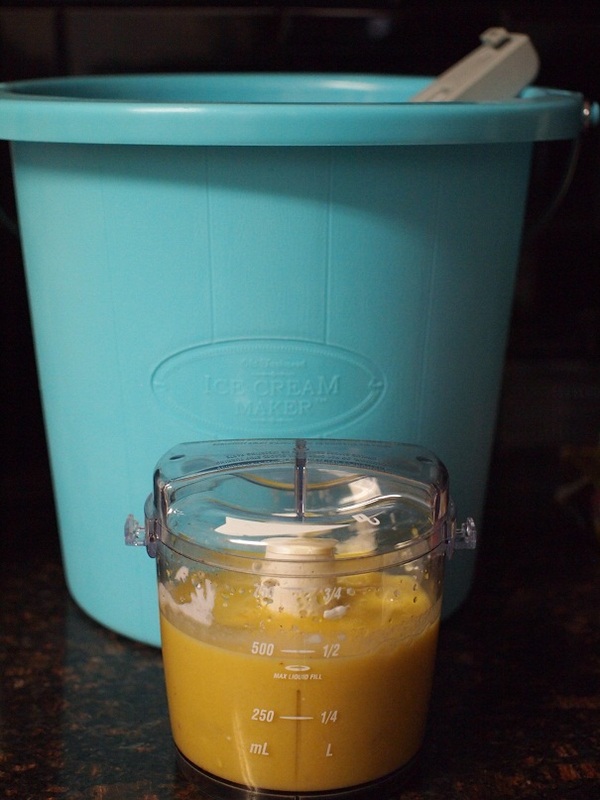 It worked perfectly for this recipe, and I like to use it in recipes that call for heavy cream. 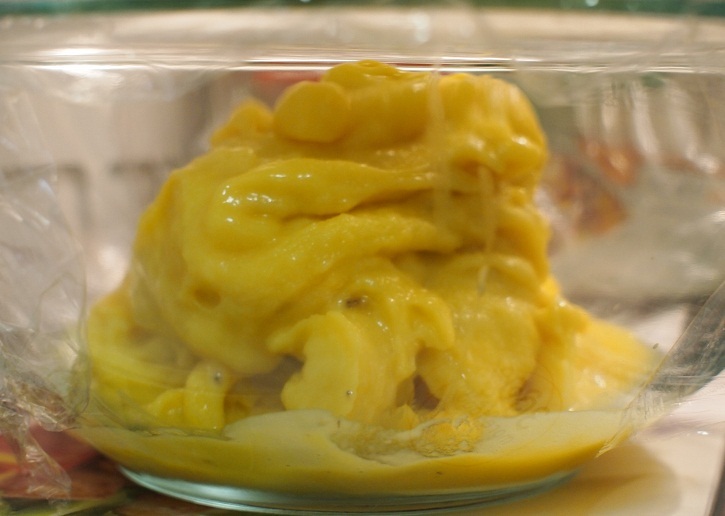 Heavy cream is just so… heavy. I wanted this to be light and fresh and guilt-free. 31 Flavors has nothing on us!